The debut SACD by David Elias, titled The Window, has become a surprise hit in the Acoustic Sounds catalog. Surprise, that is, because it was an independent release by an independent artist on an independent label. There was no major label promotion machine in effect here. But word spread quickly, grass-roots style, that this was a disc of serious sonic and musical merit. And now we've got Elias' follow-up to tout. Crossing was recorded almost entirely "live" in the studio, with few, if any, edits. There was minimal micing and the musicians were seated in a circle to capture the ambient characteristics of the room. Like The Window, Crossing was recorded directly to DSD using a Sonoma eight-track recorder from Super Audio Center. This is subtle acoustic music recorded with exceptional detail paid to high fidelity. We purchased this album after stumbling on The Window by chance and enjoying it very much. This one is just as good. Since this is a simple recording with few instruments, we feel the stereo layer is the better. Both are entertaining, though. We will not hesitate to purchase any other SACDs by this artist. Additional notes made in September follow. This SACD would not be taxing on any system. Even owners of throwaway hifi would enjoy it. It does also make a super show-off disc if you are inclined to show off the format or your system. While we do prefer the stereo SACD layer, the multichannel layer is very nice also. We have no real track preference. All are enjoyable. It's one of a very few discs where we have two copies just in case of loss or damage. On this note, we intend to get a back-up copy of The Window if and when it comes back into stock. Vocals are a bit closely miked, but overall this is a very nice recording. The kind of disc that grows on you. 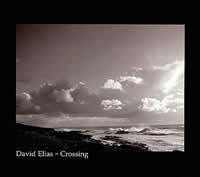 David Elias has released his latest Hybrid SACD, Crossing, and if you’re a fan of acoustic folk then I highly recommend you check this guy out. If you have not heard of him, that is not surprising, as he is as about as independent as they come. He is his own writer, arranger, label and producer. Besides his web site and his live gigs the only place his stuff is available is here and one other place, as far as I know. Audibly, the disc is superb. I know this will sound a bit over used, however, this is an audiophile quality presentation. His previous release, The Window, is of the same high quality and that too I’d highly recommend. You can read about the technicals behind the recording at his web site, however, from a listener’s perspective the music is genuine and done well. Again, if this is a style of music that appeals to you, and you haven’t listened to this artist yet, I strongly urge you to get your ears around this!